Northeast India, which has been witnessing moderate to heavy rain and thundershower for the last two days, will continue to witness on and off light to moderate rain and thundershowers with one or two heavy spells till April 17. A report published byskymetweather.com on Monday stated stated that in the last 24 hours from 8:30 am on Sunday, in Meghalaya, Barapani recorded 26 mm of rain, followed by Shillong 24 mm and Cherrapunji 12 mm. Assam’s Goalpara recorded 8 mm of rain, Mazbat in Darrang district and Pasighat in Arunachal Pradesh recorded 6 mm of rain. According to the report, a cyclonic circulation is seen over Tripura and adjoining area. Besides this, an anti-cyclone persisting over the northern parts of the Bay of Bengal is continuously feeding moisture over the northeastern states, the report adds. 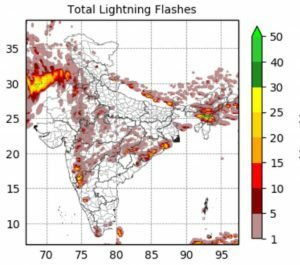 As per the report, it is expected that on and off light to moderate rain and thundershowers with one or two heavy spells will continue in Northeast including Assam, Meghalaya, Nagaland, Arunachal Pradesh, Manipur, Tripura and Mizoram till April 17. It has been reported that during the period till April 17, chances of lightning strike, wind storms and violent thundershowers cannot be ruled out over most of the parts of the northeastern states. Few isolated pockets are likely to witness spell of light rain and thundershowers. Wind storm recently damaged several houses in the southern parts of Nagaland. During the next 24 to 48 hours, similar weather activities are expected in some more parts of the Northeast. However, after 48 hours, rains will gradually start to decrease and such weather activities will also reduce. It has been alerted that in Nagaland, moderate spell of rain and thundershowers accompanied with strong winds will occur over Kohima, Longleng, Dimapur, Kiphire, Mokokchung, Phek, Mon, Peren, Tuensang, Zunheboto and Wokha till Tuesday.